View More In DVD Drives. "HAIWAY"- "CUSTOMERS ALWAYS FIRST" PLAN. - Please make sure your electronic device has a program" Media Player". - Please plug the USB interface to the USB port of the electronic devices directly, otherwise it may cause the driver can't be recognized by the devices. - Please make sure your laptop or Mac air is charging. Otherwise it may also cause the drivers can't not be run due to the low power of the devices. 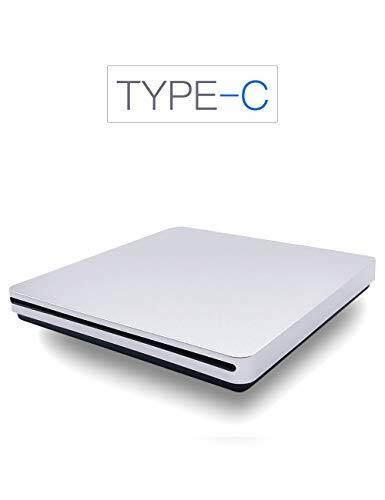 [HIGH SPEED] Haiway External DVD Drive is compatible with Type-C which brings users faster data transmission speed and more stable performance with strong fault tolerance. Higher transmission speed (up to Maximum of 5Gbps) means higher stability, faster reaction, less time waiting and greater usage experience. [PLUG & PLAY] Haiway External DVD Drive is super easy to use. Users can just simply pull out the USB cable and plug the drive into any USB port of electronic devices with supported system, it will just play automatically. No extra power is needed. [TRENDY DESIGN] The outlook design of Haiway External DVD Drive is absolutely trendy and fashional. It is slim and lightweight, with comfortable mental aluminum touch, embedded USB cable design, storable and portable that users can bring and use it everywhere without any inconvenience. [MULTI-FUNCTIONAL]Haiway External DVD Drive is super multi-functional. Customers can use it to play music, watch movie, backup data, install program and transfer files. [MULTI-FUNCTIONAL] Haiway External DVD Drive is super multi-functional. Customers can use it to play music, watch movie, backup data, install program and transfer files. [STRONG COMPATIBILITY] Haiway External DVD Drive is supported by variety of systems: Microsoft Windows XP/2003/Vista/7/8/10. Linux Os, Mac Os Supported by variety of devices: Laptop, Desktop, Mac Pro, MacBook Air, Mac Mini and ect. If you have any questions about this product by Haiway88, contact us by completing and submitting the form below. If you are looking for a specif part number, please include it with your message.